Happy Tuesday, friends! Today on the blog I'm sharing these STUNNING palazzo pants that are currently $88! I love how comfy and stylish palazzo pants are. You can dress them up similar to what I did on this post or wear them more casual! These pants have a detailed with a gorgeous print, high waist and a bow tie. I've tagged a TON of palazzo pants for under $40 at the bottom of this post if you're palazzo pant obsessed like me! 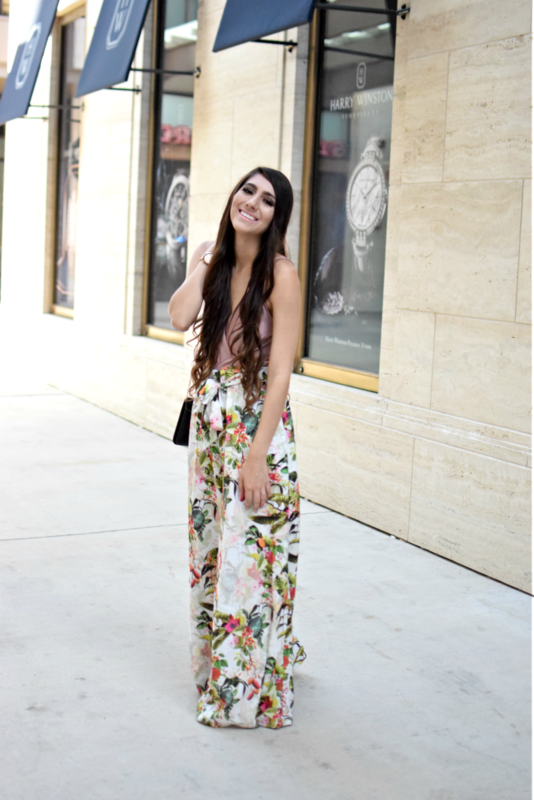 I'm a huge fan of pairing palazzo pants with bodysuits and this one from TopShop is so pretty! I love how the blush color compliments the print of the palazzo pants and don't even get me started on the back detailing! Talk about obsessed! Did I mention it comes in colors?! For under $50 you can find many ways to wear this bodysuit like going out on a Friday night or even just throwing on a leather jacket over it with high waisted jeans. The possibilities are endless! Here are a few more palazzo pants for under $40 that I'm obsessing over!